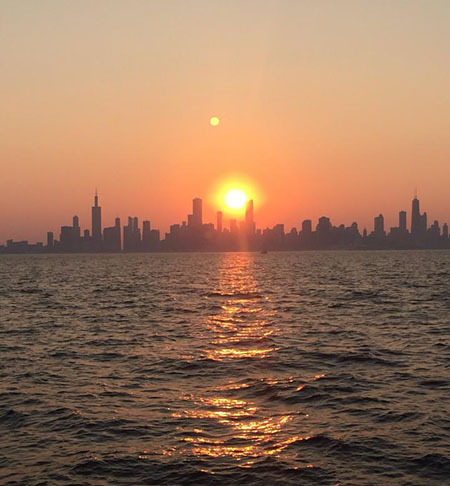 Enjoy the one of a kind Chicago skyline from the deck of the SunSea, your private chartered yacht. Take in the great views from Lake Michigan or enjoy a unique cruise down the Chicago River through the hear of downtown. Our Chicago yacht charter is maintained to the highest industry standards and will make your event an occasion to remember! Our friendly crew will provide you with excellent service, hospitality and relaxing accommodations. The SunSea was designed as a place to create memories, to relax, and enjoy a day on the water. Bring your favorite music and enjoy it throughout the yacht. We offer a variety of bar and menu options so you have the ability to create your own cruise. This handsomely appointed yacht offers a large front deck, a spacious fly bridge (top deck), and full indoor salon with sit-down bar. The charming living quarters include a main salon (indoor seating area) including full bar, lower level dining area, fully equipped kitchen, and two restrooms. Two outdoor decks provide additional seating to take in the beautiful views of the Chicago skyline and river. Let us design your next charter!